CDAC Noida Project Engineer Recruitment is for the Candidates who are looking for a job in the organization Centre for Development of Advanced Computing. They announced recently on their official Web sites which is they want to hire 76 Project Engineer, Project Support Staff Vacancy.So, who are enthusiastic to enroll in this registration they have to join here on this special page to get the Notification details & fill the form within the time limitation. Basically, they want to hire based on the performance in Written Test & Interview. The Selection rounds may be decided based on the count of applications. If more in number received by the CDAC Noida Recruitment Board they should include both the rounds. Or you may focus on this page to acquire More Job Alerts. Minimum 2-5 years of post qualification work experience relevant to the job description. Full -time professional degree in Hotel management. Project Manager ₹8.68 Lacs approx. Project Engineer (Sr. Web Developer/Web Developer/ Software Developer) ₹4.79 Lacs approx. Project Engineer ₹4.79 Lacs approx. Project Officer ₹4.39 Lacs approx. CDAC Noida will hire the Candidates based on the following rounds. 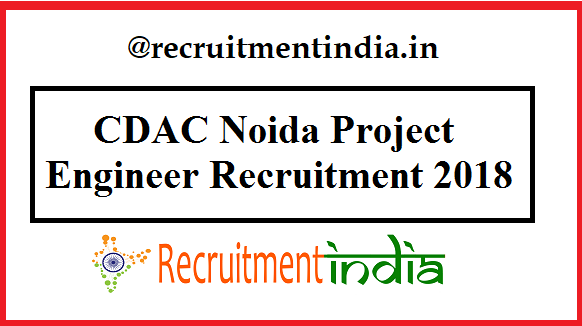 CDAC Noida Project Engineer Notification 2019: The C DAC Mainly choose the aspirants who are ready for the Contract basis. They just looking for the people to compete the short term Projects. So, this CDAC Noida Project Engineer Recruitment is purely based on the Contract basis only. It may be continuous as per the performance of the Candidates. The CDAC holding almost number of Projects which would be either Engineering, Medical & Health, etc.., So, Maximum the CDAC Noida will choose based on the Experience if the Contestant had any experience in previous they should prefer those when compared to the freshers. But, for filling the CDAC Noida Application Form, the Freshers & Experienced Aspirants are eligible. Apply CDAC Noida 76 Vacancy@ cdac.in: Based on the Requirement the CDAC Noida Board will pick the Contestants So, Kindly follow the conditions while filling the notice through Online mode. In case, you may raise any queries you can check the Official website, It also avails on this page. For Project Engineer and Supporting Staff Post,s the CDAC Noida will have the Interview Or Written Test on 1st Dec 2019. Keep all those Important Dates to submit the CDAC Noida Application Form & Participate in the Hiring process. Finally,76 Aspirants are filtered by theCentre for Development of Advanced Computing, Noida Board Authorities. If you want to know the Syllabus check once below of this page to get the idea about the Examination Pattern. The post CDAC Noida Recruitment 2019 | 76 Project Engineer, Project Officer Posts @ www.cdac.in appeared first on Recruitment India.